Chart The Course Of Your Own Internet Enterprise, Be The Master Of Your Own Destiny Online... Learn The Hidden Secrets Of Information Product Creation And Open For Yourself A Whole New World Of Profitable Business! Yes, affiliate programs are great. They'll earn for you some amazing profits in such a short time. Yes, freelancing is cool. With the persistent demand of work to be done on the World Wide Web, you're sure to never run out of clients. Yes, Pay Per Click (PPC) opportunities are excellent money-making streams that will provide you with some fantastic earnings. But all of these income opportunities are dependent on outside sources. Once those outside sources cease to exist, so will your chances of generating income from their wells. Also, your profit margin is stable but, more often than not, static. What you're earning today will most likely be the same as what you'll be earning a year from now. The chances of increasing your pay will be slim, since your income stream is pretty much set at one level. How, Then, Will You Be Able To Increase Your Online Pay? John Reese, Allen Says, Mark Joyner, Jimmy D. Brown, John Delavera, David Vallieres... all of them Internet marketing superstars... have always promoted one answer. Time and time again, they have given their readers the one course of action that will explode anyone's potentials for profit on the World Wide Web. You have to grab the bull by the horns. You have to build your own ship to take you to the Promised Land. You need to enable yourself to write your own fate in the online game. You need to create your own product! There's no ifs and buts about it. If you want to play with the big boys, you need to come up with a product or products you can call your own. The benefits of this are immeasurable. You'll be able to determine your own profitable price for your products. You won't have to rely on suggested selling rates for them. Is demand getting low? Lower your price and see your sales rate spike up once more. Is demand on the rise? Increase your price and watch your profits soar. You'll be able to reduce the need for a unique selling proposition as you can choose to sell the product by yourself. Being the ONLY supplier will be your unique selling proposition in itself! You'll be able to extend the market life of your products by controlling who gets to distribute them and under what conditions they may be sold. You can ensure for yourself more options in earning from your products. Is the market already getting saturated with what you have to offer? Sell the resale, master resale, or private label rights of your products for some improved earnings! Being able to create a product for yourself is such a rewarding and satisfying experience! Having your own product is perfect for building the brand of your online business. You'll be able to utilize your products anyway you want. You're not restricted by any license arrangements. You're the one who can say what restrictions apply if ever you're going to allow other people to earn from your products as well. The empowerment that your own products provide will enable you to enjoy liberties you normally wouldn't have if you were earning from affiliate programs, PPC opportunities, or some freelancing work. If utilized properly, the power you wield over your own products can greatly – GREATLY – explode your income to untold levels of profitability! Not everyone knows how to create their own digital products. And even if they have the slightest idea on how to go about it, not everyone knows how to maximize the profitability potential of these products. There is no formal education available when it comes to creating digital products. People usually have to feel their own way when faced with the challenge of creating their own products. Finally, a resource is available that will help you develop an information product that's sure to provide for your online business many, many years of sustainable profit. The Internet is known as the information superhighway because it is fueled by the need for information. People use the Internet to find the information they need. If you have the information they are looking for, then you're in business – and dare I say, in a very good business at that. Information is the primary commodity exchanged over the Internet. Your product should be focused on information about the subject you have chosen to pursue. This is very fundamental. And your product should also be capable of digital delivery. Your audience will want to receive the information/solution you will be providing really fast and digital delivery is the only way you can answer this desire. Additionally, digital delivery will also eliminate the problems of having to ship the product to the purchasers, as well as the added burden of having to reserve storage space for undelivered items. And How Are You To Learn The Fundamentals Of Creating Your Own Information Product? You don't have to feel your way through the darkness anymore. 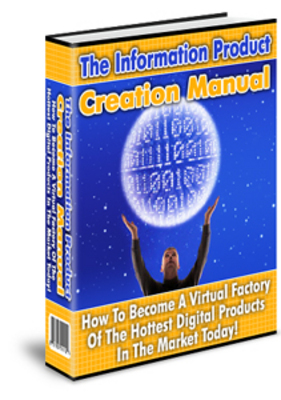 How To Become A Virtual Factory Of The Hottest Digital Products In The Market Today! How to create professional looking eBooks and special reports that are brimming with information. How to create e-courses that will have people scampering to subscribe to your service. How to create audio products using nothing but a microphone. How to create podcasts and how to make the most of them. Podcasting is one of the hottest subjects on the Internet today, but only a few guides have been written to explain every intricacy related to their creation and proper usage. How to create video products using tools that you can freely download from the World Wide Web. How to create article sets with Private Label Rights and how you can effectively market them. How to create websites you can sell for monstrous profit. How to determine a hungry market that will dictate what products you should create and what subjects you should cater to. How to effectively write for an online audience. The Information Product Creation Manual is jam packed with highly informative content. With this eBook/guide, you'll receive 15 chapters filled with tips and strategies on how to create highly profitable information products for your online business. That's 15 chapters of information, minus the fluff! If you want to start building an Internet empire, then creating your own products should be the first step in achieving such a goal. And the Information Product Creation Manual is your best partner on the road to online prominence! The Information Product Creation manual information product creation;product 115174234 21.00 best-books Fresh Download Available!